I love it when someone can find a personal connection to some of the ephemera that's shared on Papergreat. "Hi! Wow. This is kind of crazy. I got to your website while doing an internet search for Bessie Carrier Lester, whom I believe is the same person as Bessie N. Carrier (Lester being her married name). If it's the same person, she was born in 1895, went to Staunton High School, attended Mary Baldwin College in Staunton, married my husband's great uncle sometime after WW2, and passed away in 1962. With no children or (to my knowledge) any surviving siblings, she was the last living member of her family. "Just last month, my family rediscovered some of the Carrier's silverware and family bibles in one of our basements, where they had sat forgotten for decades, and have been trying to learn as much as we can about the Staunton Carrier family, and Bessie Carrier in particular. I would love to be in touch with you about the papers you've found!" Nina and I have already been in further touch about The Bessie Papers and I intend to get them into her family's hands. I will have further updates later. Old booklet for Harrisburg's Capital Roller Rink: Debra Jane Seltzer of RoadsideArchitecture.com writes: "The building houses Tyco Electronics now." And she shares this picture. 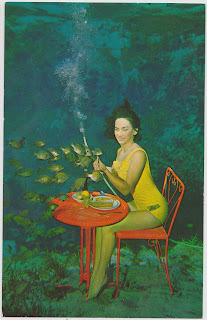 #13: A meal at Weeki Wachee Spring (Postcard Blogathon 2013): Bonnie Jeanne (aka PostMuse) writes: "I went to Weeki Wachee Spring with my ex-mother-in-law the year before she was my mother-in-law. It was my first ever vacation where I stayed in a real hotel, not a cabin with kitchenette. I had visions of ordering room service like in the movies, which were dashed when I discovered it costs money. 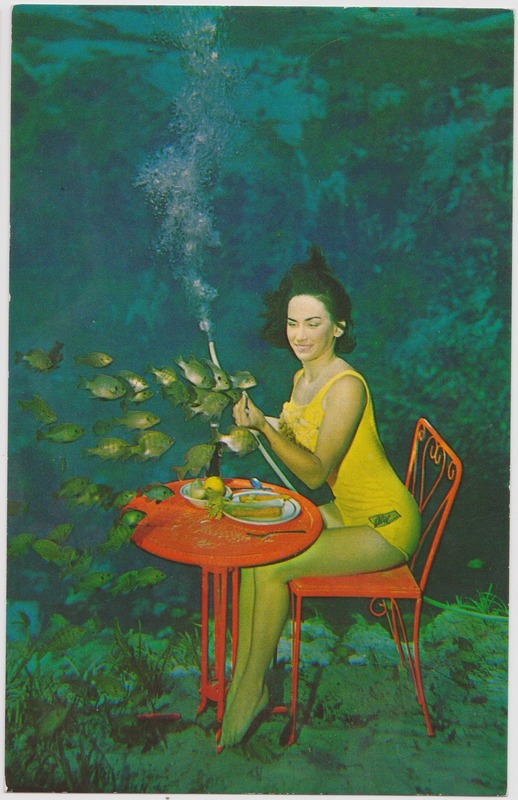 But I loved the mermaids. When NOAA announced mermaids don't exist last year, I was furious. I had seen them with my own eyes. Thank goodness the fine people at Animal Planet produced that wonderful documentary that aired (recently) to prove once and for all mermaids exist. I'm looking forward to the unicorn documentary next year." 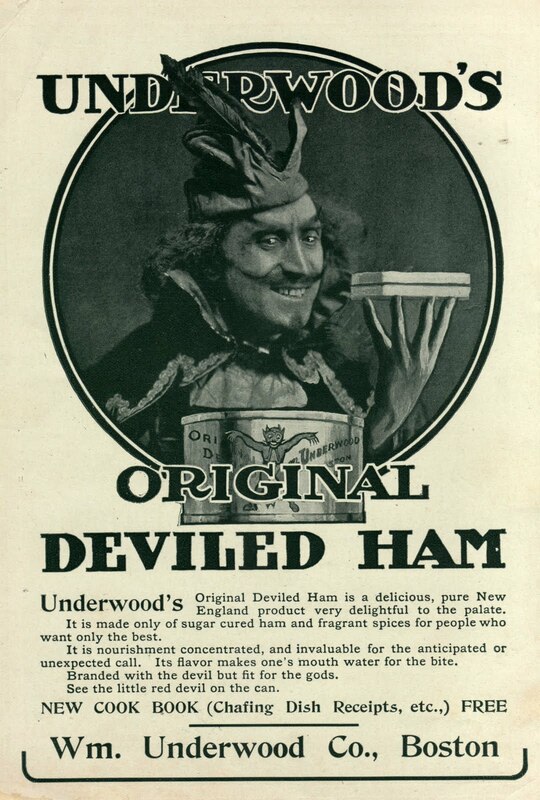 Oldest food trademark still used in the United States: Anonymous writes: "I love this stuff. My mom would spread the deviled ham on some Ritz crackers as a snack back in the 80s, but I had no idea it was such an old product. So my kids tried it recently and they loved it. It was cool to share my story as a kid with them and about the deviled ham and how my mom would have these lil cans hidden and only pulled them out on special occasions. My kids love this stuff now." 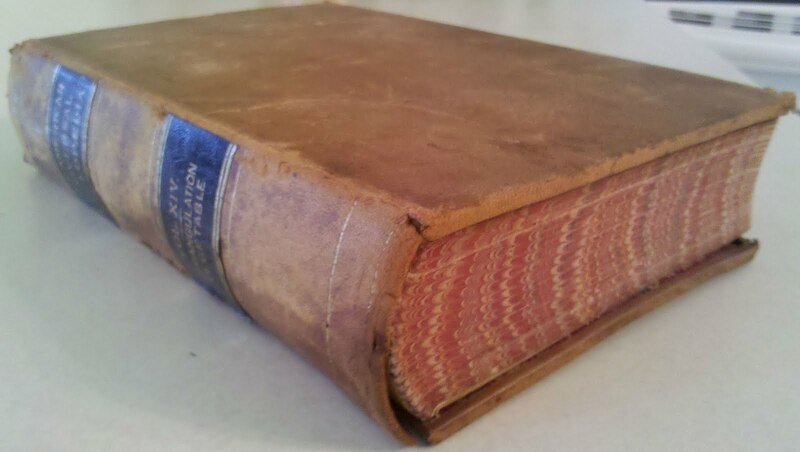 Requiem for a 129-year-old encyclopedia volume: The author of Jelly-Side Up writes: "I love this entry. I'm linking to it in the comment section of my post a scandal going on right now in Urbana, Illinois, over the purge of nonfiction books aged 10+ years. Your story is charming; thank you for sharing! What a great find that encyclopedia was! Here is my blog post: A Storm of Skies and Pages: “Bookgate." 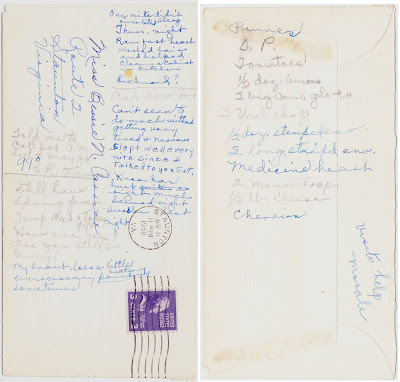 More stuff from inside "A Thousand Ways to Please a Husband": Helen, who authors the Button and Snap blog, writes: "I was in the Girls Friendly Society in Los Angeles growing up. We always made and sold Queen's Cake as a fundraiser. Thanks for sharing the recipe — I'm looking forward to making it again. That's a pretty creepy slogan, but I'd never heard it before. Luckily, the motto in the U.S. is 'Bear ye one another's burdens and so fulfill the law of Christ.'" 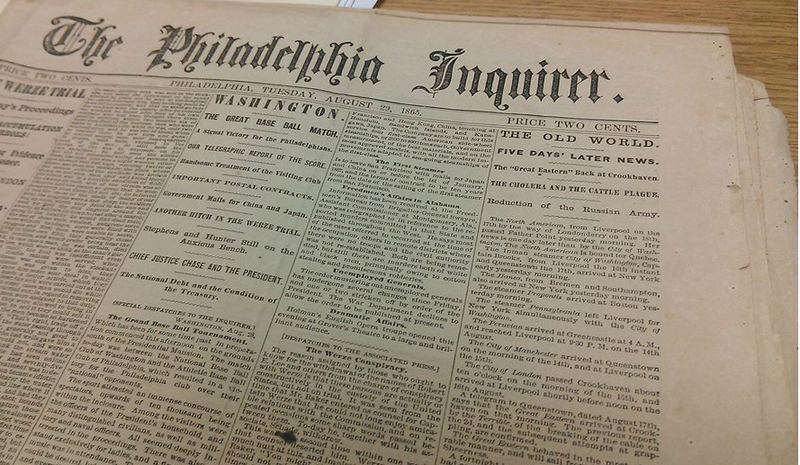 More utter goodness from the 1865 Philadelphia Inquirer, Part 1: My super-smart and always-yearning-to-learn wife1 writes: "Interestingly, the thing that jumped out at me was rinderpest. ... Did you know that was the catalyst in creating a germ theory of disease responsive to vaccination? (I've learned this from my biology coloring book!)" Great links: Vincent Price's travels and St. Elsewhere history: Daniel Butterfield, author of The St. Elsewhere Experience, writes: "Thanks so much, Chris, for the shout-out, and even more for sending me your copies of On Call! This has refueled my creative juices re: St. Elsewhere, and I'm looking forward to getting the other six posted. And the work isn't thankless — it's a pleasure!" Four things tucked away inside "Mary Meade's Magic Recipes": Jen Walker, whose runs the website Unique Kitchen Items, writes: "Thanks for sharing this. Such a different post and one I've really enjoyed. I love the 'Magic Flavor Recipes' advert — so cool." 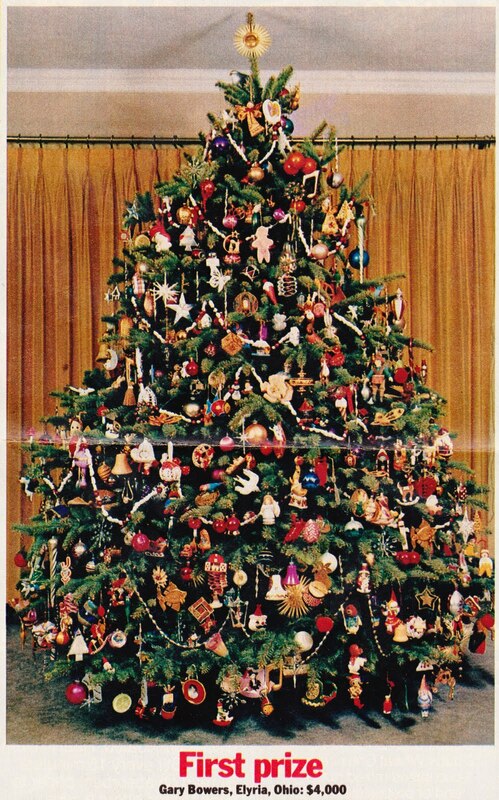 Potentially unnecessary bonus image of a blender with a face: PostMuse writes: "On a related note, a favorite video series, http://www.willitblend.com/"
Family Circle's "Most Beautiful Christmas Tree" of 30 years ago: Gary Bowers writes: "This is my family tree. It is so cool to see it published so many years later." Hooray! Another Papergreat Ephemera Connection! 1. Also, my super-smart and super-wonderful wife, Joan, just earned her black belt in Taekwondo this past weekend! She's just all-around amazing!